The German power metal which rose in the Eighties would be nothing without mentioning seminal fathers Blind Guardian. In those early days, heavily influenced by comrades Helloween, Blind Guardian evidenced speed and thrash metal. Now, in the last twenty years more or less, Blind Guardian has carved a niche in the epic melodic power metal genre. Their ninth album, At the End of Time continues the tradition and, once again, demonstrates their mastery. Drawing from familiar themes, vocalist Hansi Kursch composes from the writings of Michael Moorcock, George R. R. Martin, Robert Jordan, Peter S. Beagle and, interestingly, from the English puritan John Milton. To the latter, Kursch writes about Lucifer's heavenly rebellion from Paradise Lost, a fine topic for heavy metal, on Control the Divine. However, he also pens Curse My Name from a relatively obscure piece The Tenure of Kings and Magistrates, a political writing where Milton legitimates the killing of a king who didn't carry out his duties. Heady stuff which only shows Blind Guardian's excellent skill to combine intelligent lyrics with massive metal. Typical Blind Guardian abounds on At the End of Time. The epic starts the album with Sacred World, which opens and closes with orchestral movements. Then Blind Guardian will powerful, heavy, and near pummeling on Ride of Obsession, A Voice in the Dark or Road of No Release. The latter has a epic choral vocal arrangement. Medieval and English expressions are favored on Milton based song Curse My Name, and also the second ballad War of the Thrones. More traditional heavy metal seems to inform both Valkyries and Control the Divine, but the epic nature of metal certainly soars. 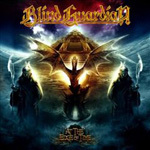 It's all pure Blind Guardian: epic and entertaining from one of the quintessential melodic power bands in the world. Recommended. At the End of Time is all pure Blind Guardian: epic and entertaining from one of the quintessential melodic power bands in the world. Recommended.